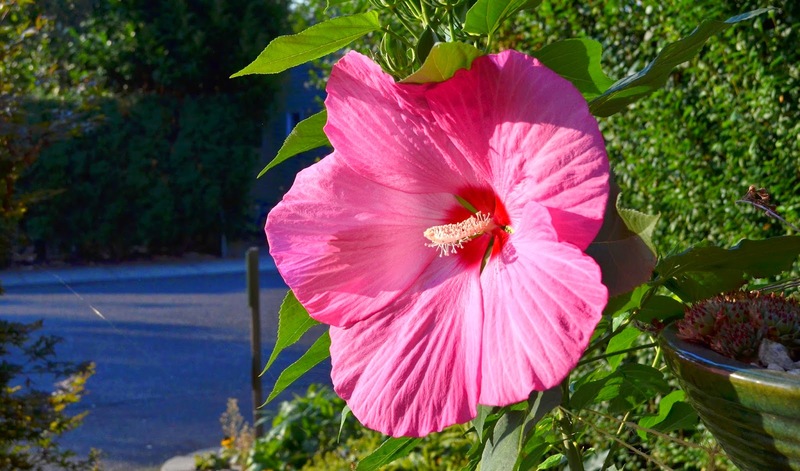 Giant hardy Hibiscus moscheutos 'Pink Clouds' is offering up it's first pink-tastic, blooms. Massive, 10 inch, blooms open late in the season. They grow on 4 - 5 ft tall stalks that are late to emerge in the spring. It is a great plant for a back border. 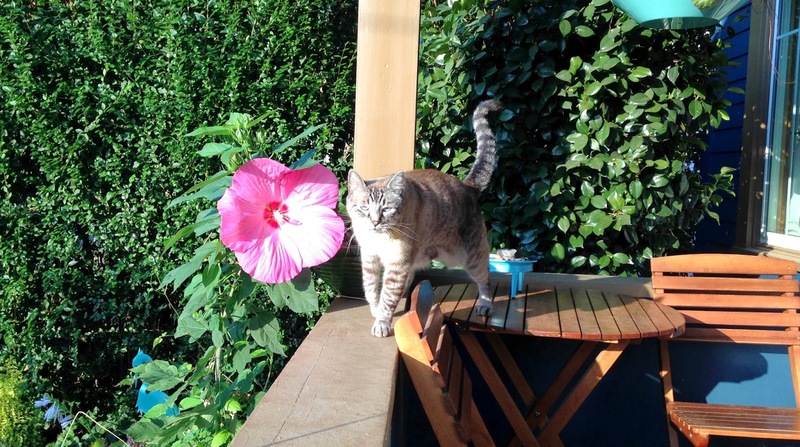 Here's a terrible picture taken with my iPhone showing the scale of the bloom next to my cat, 'Silver cat'. I'm so pleased I was able get blooms off of this beauty. This plant likes moist soil in full sun. That combination has not been so easy to accomplish this summer. Maybe it would be a nice companion plant with Joe Pye Weed? I see quite a few more buds maturing. So the color show will continue. Not to be outdone, the foliage is quite fun. It has leaves the shape, size and color of a Norway Maple. These blooms are a splendid way to greet autumn. I'm hopeful this hibiscus will multiply and send up more stalks next year. It's quite the blooming event. You can save seeds from the spent blooms and sow more (wait until they turn dry and brown, there will be little round brown seeds inside). The clump should bulk up too, as you hoped. Hardy Hibiscus would be a great companion to Joe Pye. Wow. That's quite some bloom! Lovely bloom! We have been having a really warm autumn so far . One of the paeonies bloomed for the first time two days ago! 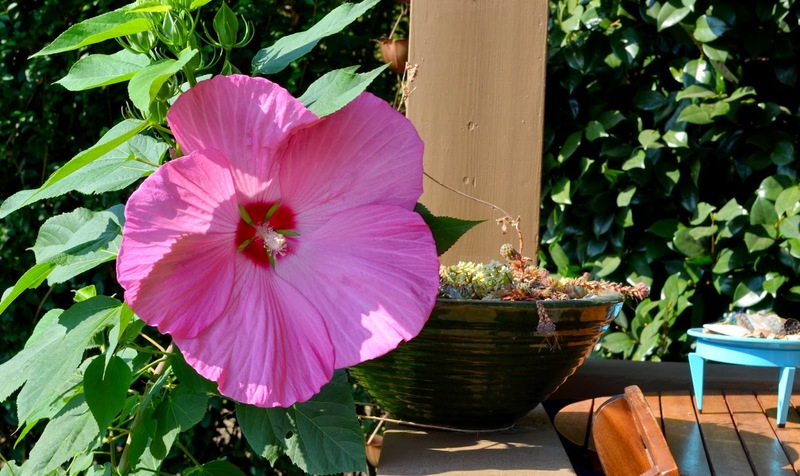 Hibiscus is a lovely plant, and that one must be the biggest I've ever seen. It sure does have a wow factor! Mine failed to return, boo-boo, so I will have to just enjoy yours. That is a serious bummer. I was really worried I would lose mine with our previous winter. I think I'll take Alison's advice and sow some of the seeds. Beautiful bloom. And your cat is adorable too! That is a very impressive flower! That's one honking big flower.....gorgeous color too. Wow! This is a huge bloom. Beautiful! You could try some cuttings too as an insurance policy. Hibiscus are reasonably easy from cuttings. This flower is beautiful! Do you think it could grow in UK, London?